fitrabbit functional drinks are being produced by organic fruit juice specialist Voglsam, situated in Hofkirchen, Austria, Europe. 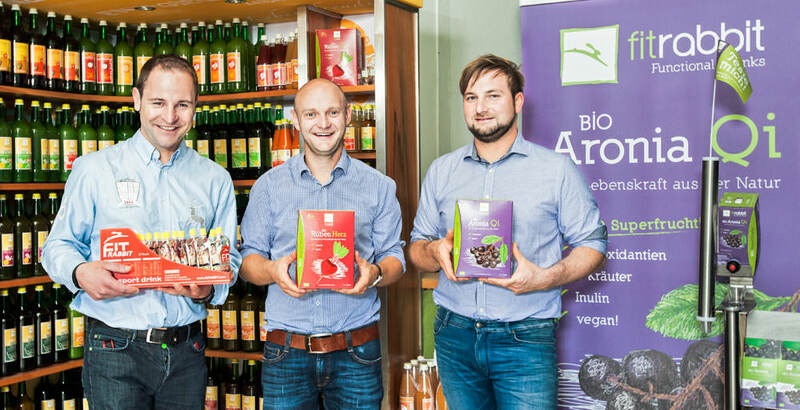 Located in the midst of a traditional orchard region in Upper-Austria, we are the Austrian orcanic juice industry’s pioneer and innovator. For 50 years we have been producing high quality fruit juice in our family business. We believe in healthy food and constantly thrive to improve our organic juices‘ development by using the latest decanter-press-technology, our decades of experience and our innovative spirit. Thus, we have become the specialist for high-quality and outstanding organic vegetable and fruit juices. In 1994, one of our organic farmers in Hofkirchen had one of his richest carrot harvests for a long time. The idea was born: Let’s squeeze apples and carrots and mix them together. So our first organic fruit juice was invented. Therefore our organic label “hasenfit organic fruit juices” was newly created and it started with full success and still is much loved. Our modern, fast moving time is demanding lots of aspects, like health, the sense of wellbeing and much more, to keep a balanced life. 2012 we implemented the next innovation: fitrabbit Functional Drinks. The idea: to use the pure power of natur for functional drinks with a real added value. Many people are aware of the importance of a healthy nutrition and why we should trust in natural foods. In sports as well as in everyday life, an optimal supply with nutrients is necessary for vitality and performance. The development of all fitrabbit products is based on recent scientific research results. We are convinced: a wholesome nutrition, a respectful handling with nature and a friendly smile will always improve your quality of life. Our vision is, to inspire people for a healthy lifestyle. This means, beside adequate exercise, a healthy nutrition with a lot of fruits and vegetable. In our modern times, a health-conscious nutrition is often neglected – we simply do not have time. We want to help bringing those people back to a healthier lifestyle! Our contribution for this ideology is the production of fitrabbit Functional Drinks and hasenfit organic juices.